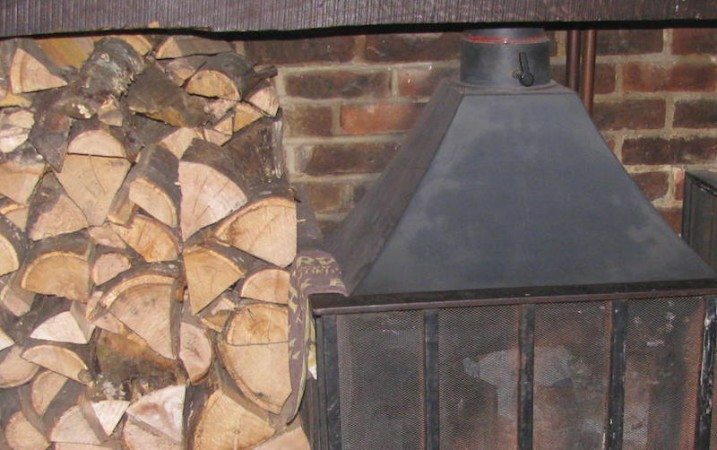 The Royal Oak in Poynings has been a family favourite for many years. Growing up just a short drive away in another beautiful Sussex village at the foot of the South Downs, it was a place we visited regularly. Poynings is a little hamlet situated at the entrance to the Devils Dyke, the legendary mile long valley which connects villages such as Poynings to the city of Brighton and Hove. The drive into Poynings village is a very pleasant one. The views surrounding it are stunning, and the village itself is quaint. If you came here during the daytime, you would definitely want to park your car at the pub and go for a walk to explore. My Dad and I have walked around these parts many times. There’s nothing like the exertion of walking up an almost 90 degree hill to get to to the top, enjoying the panoramic views whilst you catch your breath and then coming down the hill knowing you’re about to enjoy good food and a cold drink in a warm, cozy pub. The Royal Oak has always felt extremely warm, welcoming and cozy. I don’t know if it’s the wood burning stove, the welcoming locals and staff or the decor but they probably all combine to make you feel at home. Once parked and having admired the beautifully blooming, spacious beer garden we walked in through the side entrance of the pub. This brings you into a raised restaurant area of about 4 tables, a place for those wanting a bit more privacy. Steps lead down into the main part of the pub. The timber panelled bar is the heart of the pub (as with most good pubs) and I’ve never seen it empty. Locals standing at the bar sipping their local ales smile at us warmly as we walk in. We walk through to the main restaurant area at the back and the waitress seated us at a cozy table for two. The chairs are classy dark red leather with high backs. The carpet (all ‘proper’ country pubs must have carpet) is a similar shade of red and gives the whole place that warm and homely feel. There are simple red glass candle holders on the tables, and a few red lanterns on the wall to give the place enough light without being too bright. There are oak beams on the ceiling and original church benches around the edge of the restaurant. The walls are adorned with pretty paintings of cows in a countryside setting. There is a good number of choices for each course, and a great mix of classic dishes with a touch of the creative. For starters you can have the seasonal soup or the simple Springs smoked salmon (sourced very locally about a half mile down the road in Edburton). Or for something a bit different you could go for the Wild Mushrooms on toast, sweet paprika and garlic cream and poached hens egg. I like this about the Royal Oak’s menu as it has all the classic, traditional dishes on there that most people crave, but executed in a way which shows thought, creativity and quality. Everything is homemade and ingredients are local and seasonal wherever possible. 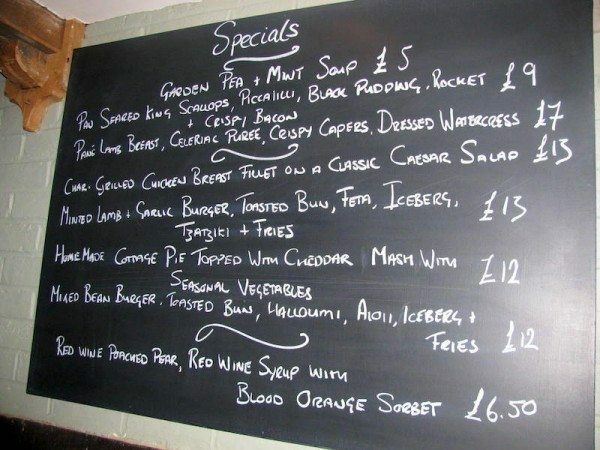 The menu is subject to change based on seasonality and there is also a large specials board which changes daily. Having perused over the menu our mouths were now watering and stomachs rumbling. Tommy had his heart set on a burger. The Handmade Beef Burger, Seeded Bun, Monterey Jack, Burger sauce, Iceberg, Tomato, Red Onion, Dill Pickle and Fries. Once Tommy had made his choice, I was now feeling confused. I had been considering the Royal Oak fish pie or the light and healthy option of Springs Smoked Trout salad with caramelised orange and pomegranate dressing but now I knew Tommy would be sitting in front of me with his handmade burger and fries, I was having second thoughts. Food envy is a terrible thing. However, I couldn’t go against my rule of not ordering the same thing as the person you’re eating with (it’s such a waste). I had another look at the specials menu for inspiration, and thankfully saw the Minted Lamb and Garlic Burger, Toasted Bun, Feta, Tzatziki and Fries. Problem solved. As we waited for our burgers, we looked at the wine menu. Eight pages long, it is extensive but easy to read. They’ve matched all of the wines by the glass with different foods but presented this in a way as a rough guide and a bit of fun. I went for a glass of the Elki Sangiovese, Vina Falernia from Chile. ‘A perfect partner to char-grilled meats such as burgers’. Good enough for me. 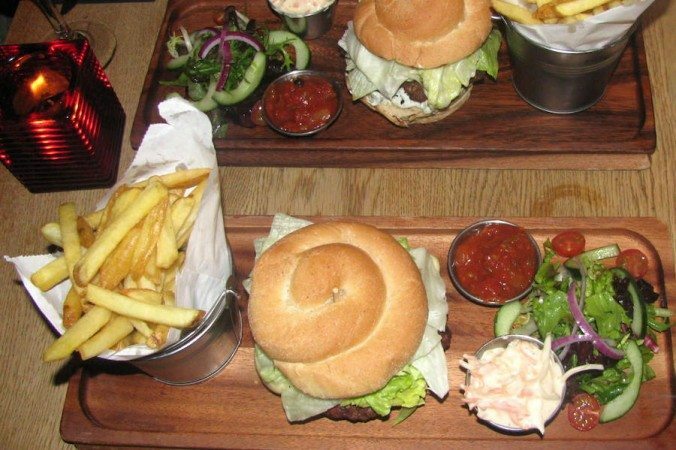 Our burgers came out on wooden rectangular boards with the fries in a silver paper lined cup, a small dressed side salad and two ramekins with homemade relish and coleslaw. The buns were warm, soft and fresh as if they’d come straight from the oven. Both burgers were meaty and juicy and had that lovely char-grilled flavour all burgers should have. The meat I’m told is sourced from Springs new butchery. The fries were lovely and rustic with the skin still on. Crispy but not too greasy. Everything tasted unbelievably fresh, including the side salad which was crunchy and vibrant. We were both very happy once we had finished, and I was relieved I’d made the right choice. That’s not to say however that we won’t be back to try the other equally tempting dishes on the menu. I wasn’t going to have a dessert, but another rule of mine is to always look at the dessert menu, whether I intend to have one or not. This is a dangerous rule I’m aware, but I can’t help myself. Anyway, as you may predict I just could not leave without trying the Trio of Banana: Banana Walnut Loaf, Caramelised Banana, Banana Ice-Cream. When this arrived, my eyes nearly popped out of my head. It looked like heaven on a plate. 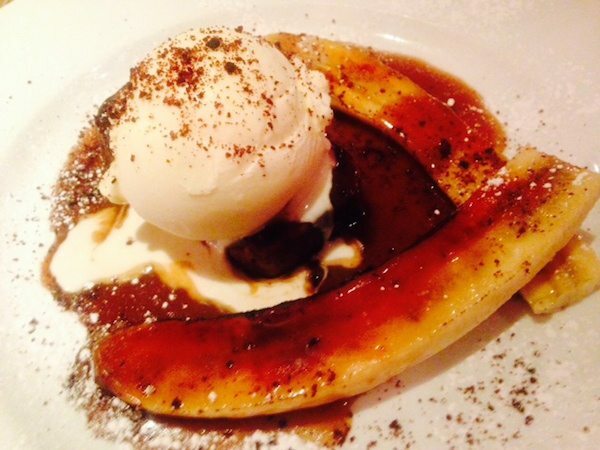 The banana walnut loaf was the centrepiece encircled by two halves of caramelised banana and a big scoop of banana ice cream. To top it all off the whole beautiful ensemble was covered in warm butterscotch sauce. It was amazing. That’s all I can say. So, when I could finally move from my seat, we walked outside into the slightly cool, summers night. What a lovely way to spend an evening. 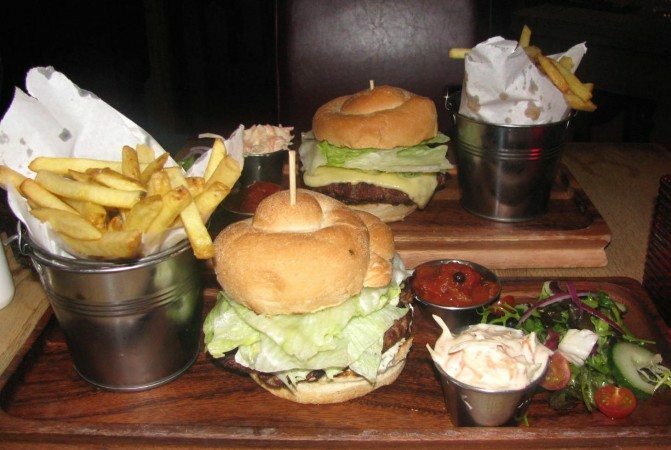 Handmade Sussex Burgers in a cozy, Sussex countryside pub. Life doesn’t get any better.